Twentieth-century art—and what it became as modern art—began with modernism in the late nineteenth century. Nineteenth-century movements of Post-Impressionism (Les Nabis), Art Nouveau and Symbolism led to the first twentieth-century art movements of Fauvism in France and Die Brücke ("The Bridge") in Germany. Fauvism in Paris introduced heightened non-representational colour into figurative painting. Die Brücke strove for emotional Expressionism. Another German group was Der Blaue Reiter ("The Blue Rider"), led by Kandinsky in Munich, who associated the blue rider image with a spiritual non-figurative mystical art of the future. Kandinsky, Kupka, R. Delaunay and Picabia were pioneers of abstract (or non-representational) art. 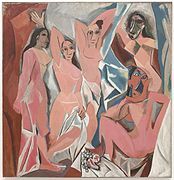 Cubism, generated by Picasso, Braque, Metzinger, Gleizes and others rejected the plastic norms of the Renaissance by introducing multiple perspectives into a two-dimensional image. Futurism incorporated the depiction of movement and machine age imagery. Dadaism, with its most notable exponents, Marcel Duchamp, who rejected conventional art styles altogether by exhibiting found objects, notably a urinal, and too Francis Picabia, with his Portraits Mécaniques.